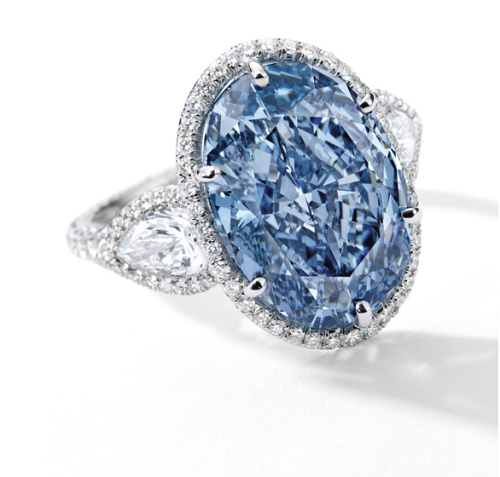 Blue Diamonds started making serious headlines with the 9.75 carat Fancy Vivid Blue diamond nicknamed the ‘Zoe Diamond’. It was sold in New York by Sotheby’s on November 20, 2014 for a then record $3.348 million per carat, or a total of $32.645 million. Prior to that sale, the record was a “mere” $1.8 million per carat set just a few short months earlier also in Geneva on May 14, 2014 by the Winston Blue, a 13.22 carat Fancy Vivid Blue diamond. The trend continued on in November 2015, when the 12.03 carat Fancy Vivid Blue diamond nicknamed the ‘Blue Moon of Josephine’ was sold in Geneva for a new record of $48.468 million, or $4.03 million per carat, breaking a few records that day. 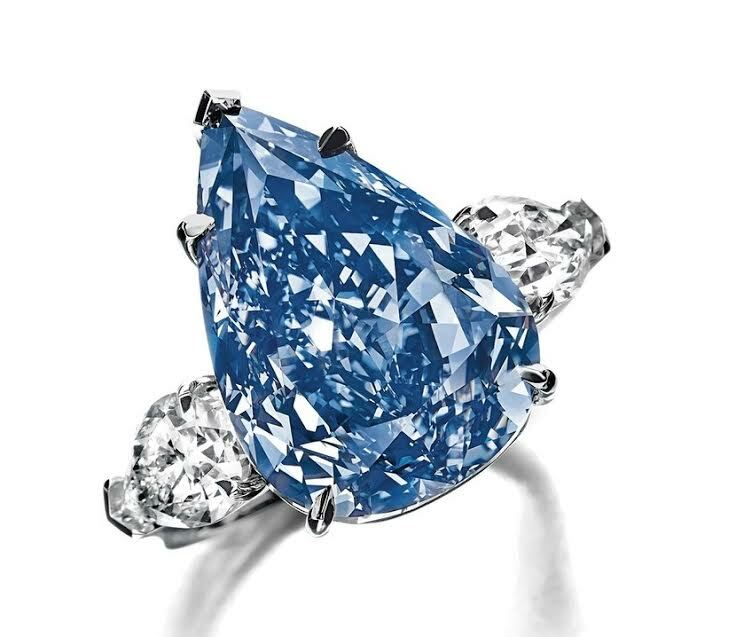 Only 5 short months later, in Hong Kong on April 5, 2016 Sotheby’s sold the 10.10 carat Fancy Vivid Blue ‘De Beers Millennium Jewel 4’ diamond, an important historical diamond, and making it the most expensive jewel ever sold in Hong Kong. In May in Geneva, two more exquisite Fancy Vivid Blue Diamonds will be auctioned and will continue the strong trend for blue diamonds globally. 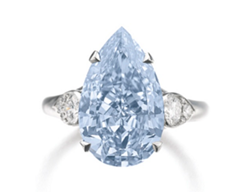 First, Sotheby’s on May 17 will showcase a unique 7.32 carat Fancy Vivid Blue Internally Flawless pear shaped Diamond. The color is immensely appealing. Sotheby’s has estimated its value to sell at a price between $15 million and $25 million, or $2.05 to $3.42 million per carat. Sotheby’s is really pushing the envelope with this valuation, but I don’t think that they would simply put a valuation they do not think is correct just for wishful thinking! Sotheby’s does have access to all those private buyers who might be interested, and thus they are setting the bar quite high. This is due to the rarity of this type and quality of diamonds. Although we have seen many unique Fancy Vivid Blue diamonds in recent auctions, their number can actually all be counted on two hands. There are simply not enough diamonds of this caliber out there to satisfy the intense demand for them. However, it will take a really big push and deep pockets to make this diamond break the world record of $4.03 million per carat (it would need to sell for a total of $29.5 million to break that record, which I really doubt will happen). Due to its size, it falls under the Fancy Vivid Blue 5-10 carat category. The current record in this category is the 9.75 carat Fancy Vivid Blue ‘Zoe’ diamond, which started the big blue diamond trend back on November 20, 2014 when it sold for $3.348 million per carat. This valuation of per carat price would be on the higher end given this diamond’s smaller size, which happens to also be a pear shape. 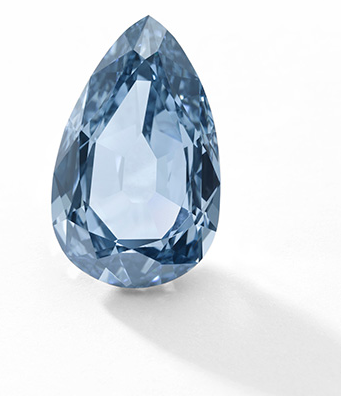 The following night, Christie’s will be auctioning off a far more momentous gem – the largest Fancy Vivid Blue diamond ever to appear in auction. It is the 14.62 carat Fancy Vivid Blue diamond nicknamed the ‘Oppenheimer Blue’. It was once owned by Sir Philip Oppenheimer, of the family that runs Anglo American plc and De Beers. 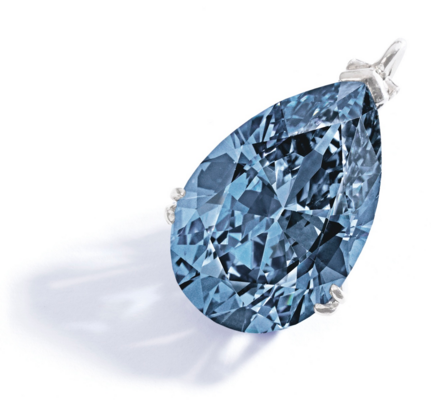 This is a historic blue diamond, and Christie’s expects it to be sold at a price between $38 million and $45 million. This valuations translates to $2.6 million to $3.08 million per carat. The diamond is literally twice the size of the 7.32 carat diamond being sold a day earlier, yet its valuation is less on per carat price. 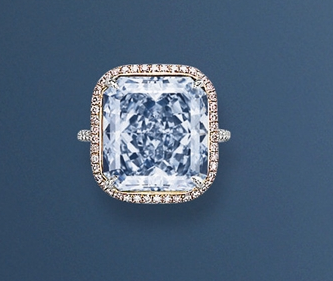 One of the few reasons for this is maybe that the color is a weak Fancy Vivid Blue, which impacts the value of the diamond, that Christie’s is being conservative, or perhaps that they want to evaluate low and allow the diamond’s final selling price to exceed the high end of its price spectrum, allowing it to further make headlines. This diamond has the potential of becoming the most expensive jewel ever sold at an auction if it exceeds the total price paid for the 12.03 carat ‘Blue Moon’ diamond’s price from this past November. 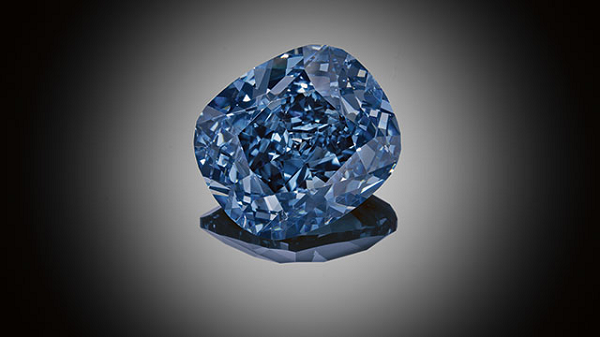 Sotheby’s is offering a special Fancy Intense Blue diamond on May 17, 2016. 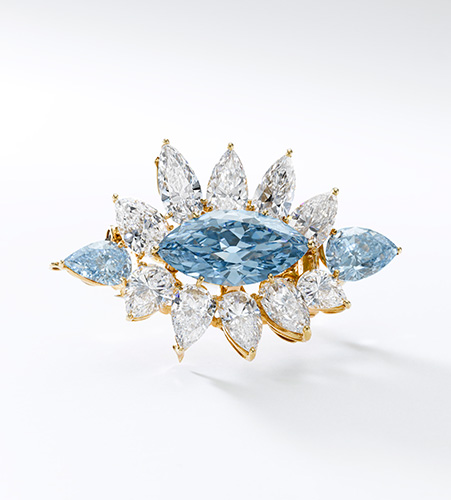 It is a 6.64 carat Fancy Intense Blue marquise shaped diamond and placed on a beautiful brooch by Alexandre Reza. It is valued at $10 million to $14 million, or $1.5 million to $2.11 million. It also has 2 blue pear shaped diamonds on each side. In the Fancy Intense Blue 5-10 carat size category, the last such diamond on the market was a 5.51 carat sold on November 13, 2013 which sold for a total of $5.43 million, or $985k per carat. However, the record per carat price is held by a 1.74 carat round brilliant diamond with VVS1 clarity. It was sold for $1.106 million per carat. When this 1.74 carat round diamond was sold and broke the world record per carat, no news media reported it other than The Diamond Investment & Intelligence center. It is safe to say that this 6.64 carat diamond will break a new world record per carat, since its low estimate is $1.5 million per carat. 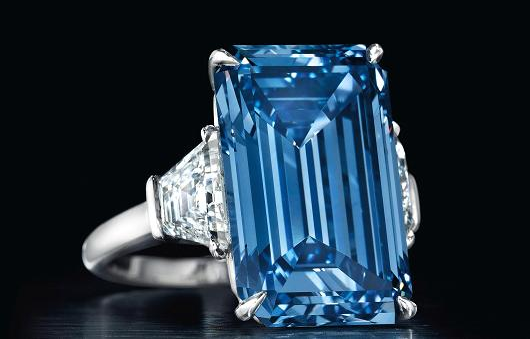 Also, since the low estimate is a total of $10 million, should it sell (in case it has a reserve, which most likely it does), it will also break a record for the most expensive Fancy Intense Blue diamond to ever be sold at auction. The current holder of that title is a 13.39 carat Fancy Intense Blue diamond that was sold back on May 14, 2008 for a total of $8.79 million, or $656k per carat. It also means that if this 6.64 carat diamond sells for its low estimate of $1.5 million per carat, the price of Fancy Intense Blue diamonds appreciated by more than 128% over the 8 year period, or by over 35% since the last record on December 10, 2015 by the 1.74 carat round diamond, which makes it over 70% on an annualized basis.